So, daylight savings time went into effect this morning. I got an extra hour of sleep and I am WAY too excited about it! My doggie and I had a nice lie-in until it was time to get ready for work. Did you all do anything awesome with your extra hour? Unless you live in Arizona, then you didn’t get a magical hour this morning. But, then again, you don’t loose an hour in the spring either, so I suppose it balances out. Last weekend I was away at the ACTFest theater competition in Wetumpka, AL. I was stage managing ‘William the Bard’ for the Park Players. It was lots of fun, but it kept me busy. And then it was Halloween! My favorite holiday. We gave away books at Little Prof and it was pretty awesome. We also had candy because as Neil Gaiman says, candy is important! I may have overdosed on Cool Mint Oreos. My personal challenge to read 100 books I’ve never read is going well! I just finished book #94 – My Life as a White Trash Zombie by Diana Rowland. I got it in Audible’s Shock-tober sale. It was pretty fun; a self-aware zombie working in a Louisanna coroner’s office and trying to figure out the reason she’s not dead. Also, what flavoring goes best with brains? I’ll have a review up later, probably into the new year. I’ve talked about this book and #71 a little bit already when I reviewed Courtship & Curses. This is book 1 in the Leland Sisters series. Courtship & Curses, though more recently published, is actually a prequel to these books. The Leland sisters are distinguished by being twins, by sharing their birthday with Princess Victoria, and by being witches. Magic, sadly, is not one of the social graces that would distinguish them during the season. In fact, only their governess, Ally, and their pestilential younger brother know about their power. Once the season has begun it is a very good thing that the girls do have power. Before long their governess is missing and the girls have discovered a plot to control the young Princess Victoria with magic. On top of all of that, Persy has fallen in love, but she can’t tell if his affection for her is real or the result of a charm cast under the influence of too little sleep and too much champagne punch. I enjoyed this book, although there were a few patches. I think Courtship & Curses is the best of the series thus far. The attention to detail in describing the time period was very nice. I also liked seeing a young Victoria in the days just before her reign began. I would love to see more stories in the series with the twins as adults still working for the good of the realm. This book focuses mostly on Persy. Pen is present, but Persy is the narrative focus. 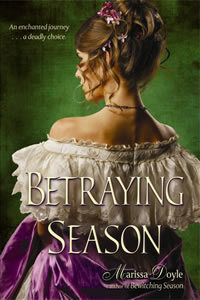 Pen gets her chance in the second book, Betraying Season. Now the rough spots – Persy has seriously low self-esteem. She thinks Pen is much more attractive than she is despite the fact that they are twins. Pen has a vivacity that Persy feels she lacks. I’ve been a sixteen-year-old girl, so I can sympathize with her feelings, but it did get a little overwhelming at times. I read this book in one night so I didn’t have to dwell on it for long. I suspect that I would find it more objectionable in an audiobook. There are a few things that I noticed because I read the books out-of-order. Some of the characters who are set up as young adults in Courtship & Curses are adults in Bewitching Season and have not grown into the people I thought they would be. Granted, this is because Courtship was written three years after Bewitching. I’m sure Dyle had no intention originally of writing entire stories around the previous generation and therefore didn’t think too closely about how they would have handled their own adventures. Ally has a romantic sub-plot with the magician who was forced to kidnap her. He is being manipulated by threats to his family, but he’s still keeping the woman he professes to love in a dangerous situation. There isn’t a Stockholm Syndrome feel to the romance, so that’s good. But I have trouble believing that an intelligent, powerful young woman would fall in love with a man who is willing to let her die to protect his father. Actually, Charlaine Harris addresses this very thing in one of her Sookie Stackhouse novels. Sookie’s boyfriend Quinn has a mother with a gambling problem. This leads to her owing some very bad people a ridiculous amount of money. They’re willing to cancel the debt if Sookie will do a job for them. Quinn gets her to do it, but afterward she calls it quits. She can’t deal with a boyfriend who is willing to risk her life. It’s not that she doesn’t think he should help his mother, but that she wants a partner who puts her first. Ally is actually married to her kidnapper in the second book. They have put their troubled start behind them and are starting a family. I find the family dynamic very believable, but only when I let myself forget how they met. Overall, I did enjoy this series as a whole. I would probably recommend that a new reader read the books in publication order rather than temporal order like I did. #70. 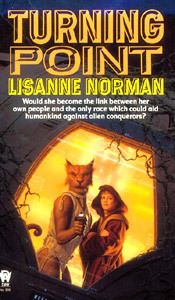 Turning Point by Lisanne Norman Now for something completely different! This book is soft science fiction rather than historical fantasy. In one of those quirks of publishing only books 1 and then 5-8 are currently in print. Volumes 2-4 are available used online though (I like Powells, but Amazon is also an option). I read the second book in this series about 15 years ago and liked it, but never really got around to getting any more. Then, back in August I was talking to my best friend about a space opera series she was reading. All of a sudden, I had to read this series again. So, I ordered the first book. And I liked it. It is much shorter than later books in the series and ends somewhat abruptly (the heroes have succeeded in their primary mission, but not yet escaped), but I really enjoyed it. The book is set on the planet of Keiss, a human colony in the far reaches of space (relative to Earth). Carrie and her family were in the first wave of colonists and everything was going well until the Valytegans arrived and overwhelmed them. The Valytegans are a lizard-like alien race bent on conquest. Carrie and her family are now part of the resistance, but she brings something special to her side. Carrie and her sister Elise share a telepathic bond which allows for utterly secure transmission of information. The downside is that Carrie feels all the pain that Elise experiences. When Elise is captured and executed the backlash from the shattered bond nearly kills Carrie. Desperately, her mind reaches out in search of help. She finds it in the form of Kusac. Kusac and his team are Sholans, aliens that look like a cat/human hybrid (think Ron Perlman from Beauty & the Beast). The Sholan scout ship has crashed on Keiss and Kusac is alone and wounded. For the Sholan’s telepathic gifts are prized, but not incredibly rare. When Kusac feels Carrie’s mind crying for help he bonds with her in the hopes that she can help him as well. Together, the humans of Keiss and the stranded Sholans might be enough to defeat the Valytegans and avenge Carrie’s sister. This is the second book in the Leland Sisters series. In book 1 Persy and Pen thwarted a plan to make Princess (now Queen Victoria) a magical puppet. Now Persy is untied with her true love, Ally is married, and Pen is feeling very left out. She has come to Ireland with Ally and her new husband to study magic further. Pen feels that she wasn’t enough of a help during the events of Bewitching Season and hopes that more magical study will make her more useful. Ally, however, is having a very difficult time. She is pregnant and both her magic and her health are suffering. Ally’s new father-in-law is very knowledgeable about magic and has taken Pen on as a student. But all of his other (male) students seem to resent her inclusion into the study sessions. The only people she doesn’t feel like she is burdening are Lady Keating and her dreadfully handsome son, Niall. After nearly running over Pen with her carriage Lady Keating seems to have adopted her as almost a pet. She invites Pen to come to tea, and dinner, and even to a visit to her country estate. Niall is no less charming and attentive. 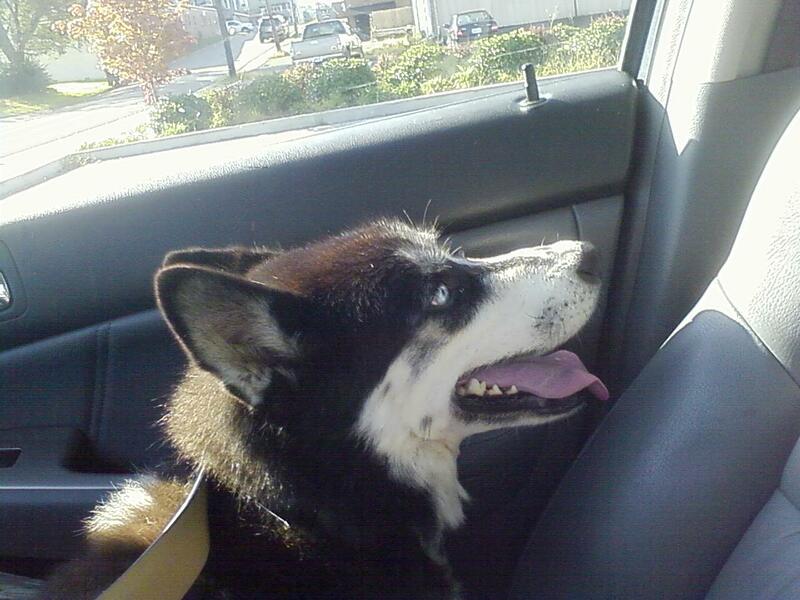 In fact, Pen begins to think that maybe he has stronger feelings for her than politeness. The only one who doesn’t seem to like her much is Lady Keatings daughter. With so much kindness and attention being showered on her is it any wonder she doesn’t see the danger she is in until it’s almost too late? So, once again, in this book we have a problematic romance. 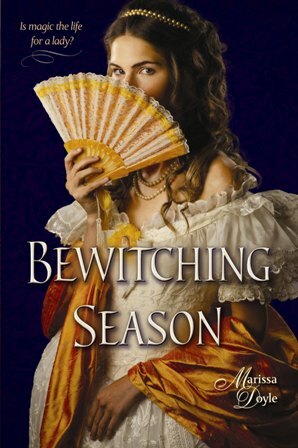 In Bewitching Season I had a problem with the romance between Ally and her soon-to-be husband. In this book I find the relationship with Niall difficult. Niall is ordered, by his mother, to capture Penelope’s interest. He goes along with it because he always goes along with his mother. Then he gets to know her and really likes her. He doesn’t want to let his mother use her for her own nefarious plans (and they are really nefarious). So, his big plan is that he’ll seduce her! Yep. That’ll work great! She needs a maiden for her ritual so he’ll make sure that Pen no longer fits the bill. Um… This is my romantic lead? Really? He could just, oh, I don’t know, tell her! But that would be too easy apparently. Also, how is it that Pen, after just dealing with a similar sort of person in the first story, just blindly trusts Lady Keating? Overall, I liked this book because of my residual affection for the other two books, but I wouldn’t recommend it on its own.